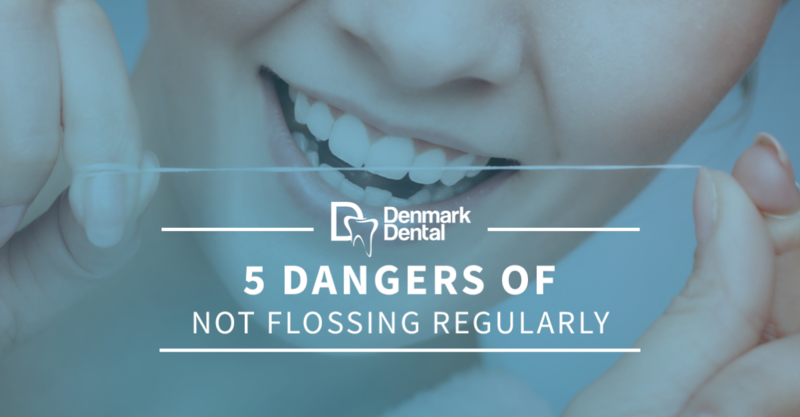 At Denmark Dental in Eagan, we understand that you dislike answering the question: “How often do you floss?” In fact, we dislike asking it, but it’s a great way to start the conversation behind why flossing is so important. Want to learn more? Read our “Is Flossing Really That Important” article. In today’s article, we will be sharing the dangers of not flossing regularly. If you do not floss regularly, you will begin to develop gum disease. Your diet, oral health habits, and lifestyle habits all affect your teeth, gums, and mouth. In fact, only 30 percent of the American public report flossing routinely and 32 percent say they never floss. Another study showed that 64.7 million adults have some form of gum disease. If the numbers don’t worry you, then consider how your oral health directly affects your life. Chronic bad breath can ruin a lot of personal, intimate interactions with those you love. A close conversation or sentimental night out with your partner can be ruined by the fact that your breath smells less-than-desirable. How does Halitosis develop? Bacteria thrive in areas of your mouth that are not maintained. The aroma those bacteria produce is a byproduct of the proteins they break down. Not flossing and tooth loss seem like they are on opposite ends of the oral health issue spectrum; however, these two are closely related. Bacteria that develops in your mouth can evolve into an infection, which results in your tooth decaying from the inside out. The result? Tooth extraction. The development of cavities is a long process, but once it starts, you cannot restore the enamel that is broken down. In fact, bacteria will produce acid that is able to break down the enamel. This leads to tooth cavities. If the bacteria are left alone long enough, they will be the genesis of serious tooth decay problems. Tooth decay can then lead to tooth loss. The color of your teeth can be improved if you remove the bacteria that’s causing them to yellow in the first place. Flossing enables you to maintain adequate oral health, which also helps teeth whitening and other cosmetic dental procedures to last longer and work better. In fact, those who smile more are said to be happier individuals. How can you smile with confidence if your teeth are discolored? It’s time you took a long look in the mirror and adjusted your oral health habits for the better. At Denmark Dental, we want the best for you and your mouth. This means that we strongly encourage you to brush and floss your teeth every single day. In fact, we want to see you at least twice a year. If you can schedule a time to see us more often than bi-annually, we will be here in Eagan, ready to help you with your oral health.